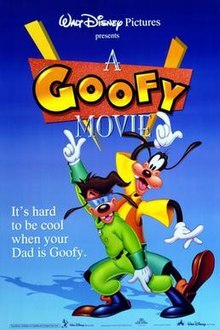 by Robert Taylor and Michael Peraza Jr.
A Goofy Movie was released theatrically on April 7, 1995, by Walt Disney Pictures to mixed reviews from critics and moderate box office success. It has since attained a cult following. A direct-to-video sequel to the film titled An Extremely Goofy Movie was released on February 29, 2000. Goofy is the single father of teenager Max Goof, although the two have a tense relationship. On the last day of school before summer vacation, Max and his best friends P.J. and Robert "Bobby" Zimuruski hijack the auditorium stage in the middle of Principal Mazur's speech, creating a small concert where Max performs, while costumed as the pop singer Powerline. The performance succeeds in making Max a school celebrity and impressing his love interest, Roxanne, but he, P.J., and Bobby are sent to Mazur's office. While waiting outside of the office, Roxanne speaks with Max and agrees to go with him to a party where Powerline's concert will be viewed live on television. However, Mazur calls Goofy and forewarns him that Max's behavior may result in him facing capital punishment. Oblivious to Max's plans with Roxanne, Goofy decides to take Max on a fishing trip to Lake Destiny, Idaho, following a cross-country map route he and his father took years ago. Before they leave town, Max manages to stop by Roxanne's house to call off their date, but when the heartbroken Roxanne mentions going with someone else, Max panics and instead fabricates a story about his father knowing Powerline, telling her he will be on stage at the concert. Despite his son's objections, Goofy plans his own trip, with initially disastrous results. Max hurts his father's feelings after Goofy inadvertently humiliates Max at an opossum-based theme park. Later, Pete and P.J. happen to meet up with them while camping by a lake. While P.J. informs Max of how all their peers back home anticipate seeing him onstage at the Powerline concert, Pete advises Goofy to keep Max under control. Goofy takes his son fishing and shows him the Perfect Cast fishing technique, accidentally luring Bigfoot to their camp. Pete and P.J. flee, leaving Goofy and Max to spend the night with Bigfoot. At night, while Goofy sleeps, Max alters the map's route to Los Angeles, where the concert is taking place. The next morning, Goofy decides to make Max the navigator of the trip. The two go to several locations that satisfy both of them. Eventually, they stop by a motel where they meet Pete and P.J. again. When Pete overhears a conversation between the boys, he tells Goofy that Max has tricked him into traveling to Los Angeles. The next day, Goofy and Max come to a junction: one leading to Idaho, the other to California. Max chooses the route to California, making Goofy stop the car at the Grand Canyon and storm off in anger. With the brake loose, the car drives off on its own; Goofy and Max chase after it and end up in a river. After a heated argument, Goofy solemnly declares that no matter how old Max gets he will always be his son, and the two finally reconcile with each other. After learning of Max's promise to Roxanne, Goofy decides to take him to the concert in Los Angeles. The two nearly plummet to their deaths down a waterfall, but Max saves Goofy using the Perfect Cast technique. Goofy and Max make it to the concert, and while attempting to sneak backstage, they end up onstage and dance with Powerline, watched by Pete, P.J. and Roxanne on separate televisions. Goofy and Max later return to Roxanne's house in their damaged car. Max tells the truth to Roxanne, though she accepts it and admits she always had feelings for him, ever since the first time she ever heard him laugh, "Ah-hyuck! "; thus, a relationship starts between them. Goofy's car suddenly explodes because of damage it had sustained, ejecting Goofy in the process, who then falls through the porch roof of Roxanne's house, and Max proceeds to introduce him to Roxanne. Jason Marsden as Maximillan "Max" Goof, Goofy's insecure teenage son. Aaron Lohr provides Max's singing voice. Bill Farmer as Goofy, Max's father who works as a photographer at a photo studio in a mall department store. Jim Cummings as Pete, Goofy's coworker whom he and Max happen upon during their road trip. Pauly Shore (uncredited) as Robert "Bobby" Zimuruski, Max and P.J. 's other best friend at school. Jenna von Oÿ as Stacey, Roxanne's best friend. Julie Brown as Lisa, a student in Max's high school who, along with some other students, makes fun of Max until his performance as Powerline made her and the students congratulate Max. She is Chad's girlfriend. Joey Lawrence as Chad, a student in Max's high school who, along with some other students, makes fun of Max until his performance as Powerline made him and the students congratulate Max. He is Lisa's boyfriend. Tevin Campbell as the singing voice of Powerline, a famous pop star celebrity who Max looks up to. Wallace Shawn as Principal Mazur, the bad-tempered principal of Max's school. Dante Basco as both the 'Nerdy kid' who calls out to Stacey at the school assembly, and as a student who says "You wailed, bud." to Max after school. Frank Welker as Bigfoot, a monster who lives in the forest. Jo Anne Worley as Miss Maples, Principal Mazur's upbeat secretary. Wayne Allwine as Mickey Mouse, who is seen hitchhiking alongside Donald Duck during Max and Goofy's road trip. He is also later seen in the audience at the Powerline Concert in Los Angeles. Brittany Alyse Smith as the Photo Studio Girl. E.G. Daily provides her screaming voice. Pat Carroll as a restaurant waiter. A Goofy Movie was the directorial debut for Disney crew member Kevin Lima, who went on to direct the Disney films Tarzan (1999), 102 Dalmatians (2000) and Enchanted (2007). In 1995, Lima said that "Instead of just keeping Goofy one-dimensional as he's been in the past, we wanted to give an emotional side that would add to the emotional arc of the story. We wanted the audience to see his feelings instead of just his antics." Although based upon a Disney TV series, A Goofy Movie was jointly produced by Walt Disney Feature Animation, Walt Disney Television Animation, Disney MovieToons, Walt Disney Animation France. and Walt Disney Animation Australia. Pre-production was done at the main Feature Animation studio in Burbank, California, starting as early as mid-1993. The animation work was done at Walt Disney Animation France in Paris, France supervised by Paul and Gaëtan Brizzi, with additional scenes animated at Disney's studio in Sydney, Australia under the direction of Steve Moore, and clean-up work done at the main Burbank studio. Additional clean-up/animation was done by Phoenix Animation Studios in Canada, and inked-and-painted by the Pixibox studio in France. According to Bill Farmer, who provided the voice talent for Goofy, in a panel interview, producers had asked him to give Goofy a "normal dad voice" as opposed to the voice he traditionally gives the character, but Farmer refused to, stating that "no one wants to hear that." The voice of Max was done by Jason Marsden, whereas his singing voice was done by Aaron Lohr. The film is dedicated to Pat Buttram, who voiced the emcee at possum park, as he died after finishing voice work for the film. The score for A Goofy Movie was provided by Carter Burwell. Burwell was the primary composer; after Burwell had recorded his score with Shirley Walker orchestrating and conducting, Don Davis was hired to rework his score rather than write a completely new one. Burwell later wrote: "My score had relied somewhat on unusual instrumentation – banjo, percussion and choir for example – and Disney wanted the sweeping scale and familiar affect of symphonic score". Davis is credited with "additional music" on the movie and the soundtrack album. The songs "I 2 I" and "Stand Out" were performed by R&B singer Tevin Campbell. The soundtrack album for A Goofy Movie was released by Walt Disney Records on March 18, 1995. Mitchell Musso covered the song "Stand Out" for the DisneyMania 7 album, which was released on March 9, 2010. A Goofy Movie was originally scheduled for a November 1994 theatrical release, but production setbacks resulted in a push-back to 1995, while The Lion King was reissued to fill in for the film's absence. The film's world premiere took place on April 5, 1995, at the AMC Pleasure Island at Walt Disney World Resort in Lake Buena Vista, and was attended by director Kevin Lima and voice stars Bill Farmer and Jenna von Oÿ; two days later, it was released nationwide. The film played a limited engagement at the El Capitan Theatre from August 25 through September 4, 2017. The film was first released on VHS by Walt Disney Home Video on September 6, 1995, and included a music video for the Parachute Express song Doctor Looney's Remedy on their video, Come Sing with Us. In the United Kingdom, it was released in theaters succeeding the Mickey Mouse short Runaway Brain on October 18, 1996, and on VHS in 1997. It was reissued on June 20, 2000, along with a DVD version, as part of the Walt Disney Gold Classic Collection. This edition includes the Goof Troop episode, "Calling All Goofs", the episode "The Goofy Success Story" from the Disneyland television series, and a "Disney-fied" edit of "Mambo No. 5." To date, this film and Doug's 1st Movie are the only two Disney animated films produced in widescreen that have pan and scan-only Region 1 DVD releases (not counting separate widescreen and pan and scan DVD releases of the two Disney/Pixar films The Incredibles and Cars). However, the film's PAL and NTSC (Japan) counterpart does have a non-anamorphic widescreen DVD, and the film is available in a letterbox presentation on LaserDisc and also in standard-definition widescreen on digital video retailers. Blu-ray.com listed that the movie will be released on Blu-ray as a Disney Movie Club exclusive alongside An Extremely Goofy Movie. On the review aggregator website Rotten Tomatoes, A Goofy Movie holds an approval rating of 44% with an average rating of 5.63/10 based on 18 critics. Variety's Todd McCarthy criticized the film's score, calling the six featured songs "unmemorable". He also felt that the personality of Goofy's character, while agreeable enough in support, proved a bit over the top for a headliner, and that "by any reasonable reckoning, he's distinctly overbearing and selfish, and responds with a bland dismissal to any opinion offered up by his son". McCarthy praised the film's technical aspects, calling them "crisp and clean". Louis Black of The Austin Chronicle summed up his review by saying the film was "bland, a barely television-length cartoon stretched out to fill a feature, and not much fun". Roger Ebert gave the movie three stars. Writing for Common Sense Media, Nell Minow gave the film 4 stars, saying that "even tweens will enjoy this road trip with Goofy." A Goofy Movie was considered a relative success for Disney, opening in 2,159 theaters at #2 on its opening weekend with $6.1 million - held from the #1 spot only because of the Will Smith blockbuster Bad Boys that opened the same weekend, with $15.5 million in box office returns. It ultimately ended its run at the US box office grossing $35.3 million. The film was nominated for "Best Animated Feature" in the production categories and "Best Production Design", "Best Storyboarding", "Best Music", and "Best Animation" in the individual categories at the 23rd Annie Awards. A direct-to-video sequel to A Goofy Movie, titled An Extremely Goofy Movie, was released on DVD and VHS in 2000. The film centers Max's freshman year in college. Characters that returned for the sequel were Goofy, Max, P.J., Pete and Bobby, but Roxanne is absent from the sequel and is not referenced. Roxanne later appears in the television series House of Mouse in the episode titled "Max's Embarrassing Date", where she is voiced by Grey DeLisle instead of Kellie Martin. The film has gained that of a cult following, particularly among millennials who grew up with the movie. On August 14, 2015, a 20th anniversary reunion for the film was held at the D23 Expo at Anaheim Convention Center in Anaheim, California. Those in attendance included Bill Farmer, Jason Marsden, Jim Cummings, Rob Paulsen, Jenna von Oÿ and producer Don Hahn. Wallace Shawn, Pauly Shore and director Kevin Lima also sent video messages. The panel also included musical performances from Farmer, Marsden, and Tevin Campbell. Around 1,000 fans attended the reunion. In 2016, Campbell uploaded a video of him partaking in a jam session with the band Enfield, in which he performed both "I2I" and "Stand Out". In June 2018, a one-week event titled "Disney FanDaze" was opened in Disneyland Paris, featuring several dedicated performances paying tribute to Disney franchises. Among these was "Max Live! Gettin' Goofy With It", which featured Max Goof performing songs from A Goofy Movie. ^ "Detail view of Movies Page". afi.com. Retrieved August 3, 2015. ^ "A Goofy Movie (U)". British Board of Film Classification. May 14, 1996. Retrieved August 19, 2016. ^ a b "A Goofy Movie (1995)". Box Office Mojo. IMDB. Archived from the original on October 1, 2007. Retrieved September 9, 2007. ^ "Drawn to Directing". Backstage East. VNU/Nielsen Business Media. 48 (47): 9. November 22, 2007. ^ a b Black, Louis (April 7, 1995). "A Goofy Movie". The Austin Chronicle. Retrieved August 13, 2009. ^ a b McCarthy, Todd (April 7, 1995). "A Goofy Movie". Variety. Retrieved August 13, 2009. ^ Hahn, Don (Director) (2010). Waking Sleeping Beauty (Documentary film). Burbank, CA: Stone Circle Pictures/Walt Disney Studios Motion Pictures. ^ Lima, Kevin (Director) (1995). Closing credits forA Goofy Movie (Animated film). Burbank, CA: Walt Disney Pictures. ^ Hischak, Thomas S. (September 15, 2011). Disney Voice Actors: A Biographical Dictionary. McFarland & Company. ISBN 0786486945. Retrieved February 27, 2018. ^ "A Goofy Movie > Credits". AllMusic. Retrieved August 12, 2009. ^ "Carter Burwell - A Goofy Movie". Retrieved December 21, 2017. ^ "A Goofy Movie Soundtrack". SoundtrackNet. Retrieved August 13, 2009. ^ Amazon.com. "Disneymania 7". Retrieved February 20, 2010. ^ "Calendar Of Feature Releases". The Film Journal. January 1, 1994. Retrieved August 13, 2018. ^ Miller, Aimee (August 13, 1994). "The 'Lion' Sleeps This Fall". The Washington Post. Retrieved July 15, 2015. ^ Spitz, Tom (April 6, 1995). "'Goofy Movie' World Premiere". The Orlando Sentinel. Retrieved August 13, 2018. ^ Mack, Mike (August 22, 2017). "Disney's "A Goofy Movie" to screen at the El Capitan Theatre in Hollywood". Inside the Magic. Retrieved September 5, 2017. ^ "Walt Disney Home Video Debuts the "Gold Classic Collection"". The Laughing Place. Retrieved May 16, 2018. ^ "Imagination for a Lifetime -- Disney Titles All the Time; Walt Disney Home Video Debuts the "Gold Classic Collection"; An Animated Masterpiece Every Month in 2000" (Press release). Burbank, California. Business Wire. January 6, 2000. Retrieved June 1, 2018. ^ "A Goofy Movie — Disney Gold Collection". Archived from the original on August 15, 2000. Retrieved May 16, 2018. ^ "A Goofy Movie Blu-ray". blu-ray.com. ^ "A Goofy Movie (1995)". Rotten Tomatoes. Flixster. Retrieved May 16, 2018. ^ Minow, Nell. "A Goofy Movie Movie Review". Common Sense Media. Retrieved September 23, 2017. ^ "Bad Boys Box Office Returns". BoxOfficeMojo. IMDB. Retrieved April 7, 2015. ^ "Legacy: 23rd Annual Annie Award Nominees and Winners (1995)". Annie Awards. Archived from the original on September 28, 2007. Retrieved September 9, 2007. ^ "A GOOFY MOVIE (1995): special digital screening Nov. 4 and 5". The Herald News. October 29, 2017. ^ a b c Inigo, Joey (August 17, 2015). "Surprisingly awesome A GOOFY MOVIE panel brings nostalgic rewind to #D23EXPO". Mouse Info. Retrieved August 18, 2015. ^ ""Stand Out" with A Goofy Movie's 20th Anniversary". D23. Retrieved August 18, 2015. ^ Gonzalez, Sandra. "Powerline performed at 'A Goofy Movie' cast reunion and it was glorious". Mashable. ^ "Watch 'Goofy Movie' Voice Actor Tevin Campbell Perform Powerline Mash-Up". EW.com. ^ "Disney FanDaze to launch first-ever event at Disneyland Paris in 2018". Attractions Magazine. October 6, 2017.